Block Patterns: Clear Wave, Glacier Wave or Cross Rib. 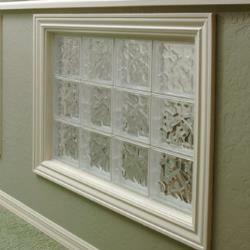 Crystal View acrylic block windows are engineered with performance and beauty in mind. The traditional block wave pattern, interlocking connecting tabs and revolutionary Breathing Method are the result of over 30 years experience in the window industry. By focusing on performance, Crystal View acrylic block windows combine all the conveniences of standard acrylic block windows with the highest performance possible, eliminating many problems associated with glass block and other acrylic block products. Designed with a traditional block wave pattern, the classic clear and frosted wave blocks create a simple privacy in settings where natural illumination is a must. 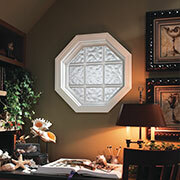 Open up any room with a Crystal View casement or awning block window or simply create a little atmosphere with the many shapes and colored blocks available. As a accent to a bathroom or kitchen, add a gold or chrome grid to the interior of a Crystal View acrylic block window and elevate its brilliance to the next level. As the popularity of block windows continues to increase throughout the United States and overseas, acrylic block is widely accepted as the best option. The lightweight, weatherability and energy efficiency of Crystal View acrylic block windows make them the obvious choice for both new construction and remodeling.